THEN: Both views look southeast at Holy Names Academy across the intersection of 21st Avenue East and East Aloha Street. NOW: At the threshold of its second century on Capitol Hill, Holy Names Academy opens each school day to about 650 students. A century of greening on the Holy Names Academy campus has half-draped the full figure of architects Breitung & Buchinger Capitol Hill landmark, with trees. However, if the landscape were stripped away we would discover from this angle (from the northwest) a Baroque Revival plant that has changed very little since the “ real photo postcard” photographer Otto Frasch recorded it almost certainly in 1908. The big exception is the tower at the north end of the school, on the left. While the earthquake of April 29,1965 did not collapse the tower it did weakened it so that it was removed. 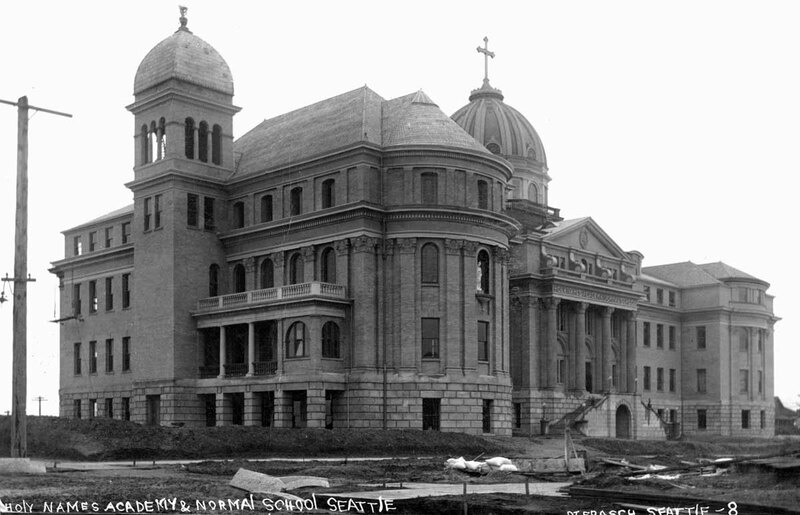 The Sisters of Holy Names arrived in Seattle in 1880 and opened first their school for girls in an available home downtown. In 1884 the school moved to its own stately Gothic structure on Seventh Avenue near Jackson Street and remained there until the Jackson Street Regrade (1907-1909) made kindling of the school when the block was lowered about sixty feet. Construction on this third campus began in 1906, the cornerstone was laid in 1907, and in the fall of 1908 the school was dedicated. Of the 282 students then attending the new facilities 127 of them boarded there. Many came from Alaska, some from “off the farm,” others from distant rural communities, and a few from nearby and yet still hard to reach contributors like Mercer Island. In 1908 Holy Names served all 12 grades plus a “Normal School” for the training of teachers. By 1930 the Normal School was no longer needed, and it closed, as did the grade school in 1963. By 1967 both convenient transportation and distant alternatives were sufficiently available to allow the school to discontinue boarding students. Classes may already have begun when Frasch took this photo but certainly the structure’s north wing (the one closest to the photographer) with the schools chapel was not yet finished, and wouldn’t be until 1925. The chapel was also included in the ongoing cycle of restoration that began for the school in 1990. Scaffolding for the grand structure’s exterior renewal has been a familiar feature for several years. The restoration has kept apace with the funding – not ahead of it. Capital Hill? I am saddened at this spelling. The chapel is a smaller replica of the chapel in the mother house in Montreal, Canada. My daughter attended Holy Names Academy and received a wonderful education there led by outstanding teachers and a superb principal. 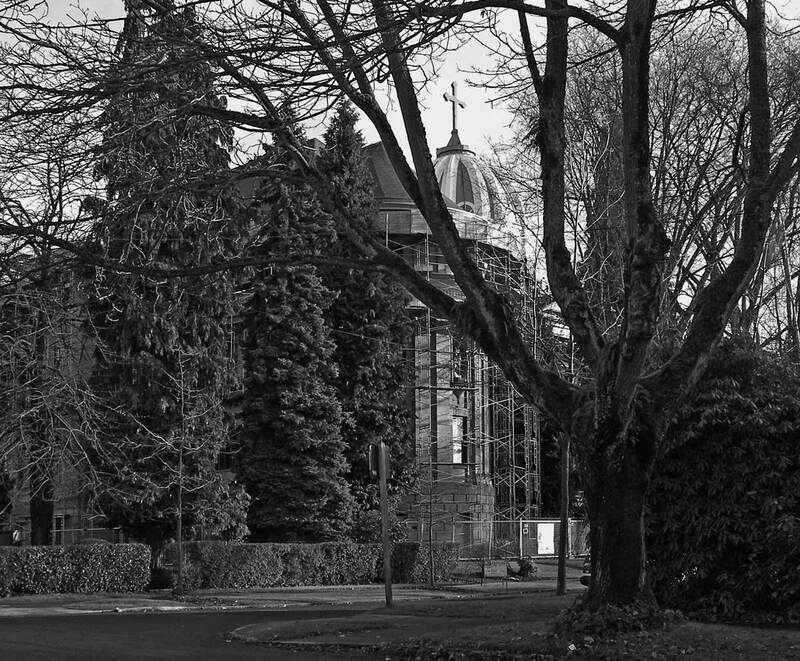 It is a beautiful landmark building in Seattle and an institution which serves the young women it teachers and the larger community of which it is a part.